Here I finish off the website I started creating in part 1 of How to Layout a Website. I finish up the right sidebar and the footer. Then I move on to clean up any loose ends that exist. I’ve made this whole website out of my head using just a photograph as a reference so that you can see how a designer thinks. Maybe more importantly you get a chance to see what mistakes I make and how to easily correct those mistakes. All of the code follows the video. 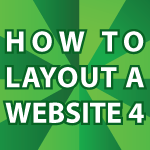 If you want the code for the menu bar refer to part 1 of this tutorial How to Layout a Website Pt 1. In the next video I’ll finish styling each individual page. Then I’ll turn the whole site into a WordPress Theme. I’ve already done a lot with WordPress Themes here WordPress How To. Oh my gosh you are seriously a life saver!! Thank you thank you! not sure how I missed that during the video. too much time staring at code I guess!